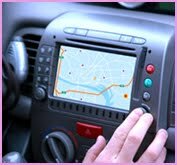 The Art of Navigation: Vroom, Vroom! 1. Aim High and Look Ahead not Down. 3. Keep Your Eyes Moving. 4. Make Sure Others See You. 5. Leave Yourself a Way Out or Margin of Safety.
. . . so I started out on the New York thruway. I was just galumphing along in such a high state that I was hanging out with various forms of the Divine. I was doing my mantra, which I usually am doing one way or another, to remember that this isn't the only game in town. So I'm holding onto the steering wheel and I'm keeping enough consciousness to keep the car on the road. At another part I'm singing to Krishna, who is blue, is radiant, plays the flute, is the seducer of the Beloved, all of whom we are, back into the merging with God, back into the formless. I am in ecstasy hanging out with blue Krishna, driving along the New York freeway, when I noticed in my rear view mirror a blue flashing light. Now, there is enough of me down, so I knew it was a state trooper. I pulled over the car, and this man got out of the car and he came up to the window. I opened the window and he said, "may I see your license and registration?" I was in such a state that when I looked at him, I saw that it was Krishna who had come to give me darshan. How would Krishna come in 1970? Why not as a state trooper? Christ came as a carpenter. So Krishna comes up and asks for my license. He can have anything, he can have my life. All he wants is my license and registration. So I give him my license and registration, and it's like throwing flowers at the feet of God. I am looking at him with absolute love. So he goes back to the car and he calls home. Then he comes back and he walks around the car and he says, “what's in that box on the seat?” I said, “they're mints, would you like one?” He said, “well the problem is you were driving too slow on the freeway, and you'll have to drive off the freeway if you're going to drive this slowly.” I said, “yes, absolutely.” I'm just looking at him with such love. Now, if you put yourself in the role of a state trooper, how often do you suppose they are looked at with unconditional love? Especially when they're in their uniform. So after he had finished all the deliberations, he didn't want to leave. But he had run out of state trooper-ness. So he stood there a minute, and then he said, “great car you've got here!” That allowed me to get out. And we could kick and spit and hit the fenders and say, they don't make `em now like they used to, and tell old car stories. Then we ran out of that. I could feel he still didn't want to leave. I mean, why would you want to leave if you're being unconditionally loved? Where are you going to go? You've already got what you wanted. What are you going to do? That takes care of your power needs, all of it. So I started out on the New York thruway. I was just galumphing along in such a high state that I was hanging out with various forms of the Divine. I was doing my mantra, which I usually am doing one way or another, to remember that this isn't the only game in town. So I'm holding onto the steering wheel and I'm keeping enough consciousness to keep the car on the road. At another part I'm singing to Krishna, who is blue, is radiant, plays the flute, is the seducer of the Beloved, all of whom we are, back into the merging with God, back into the formless. I am in ecstasy hanging out with blue Krishna, driving along the New York freeway, when I noticed in my rear view mirror a blue flashing light. I see your license and registration?" I was in such a state that when I looked at him, I saw that it was Krishna who had come to give me darshan. How would Krishna come in 1970? Why not as a state trooper? Christ came as a carpenter.